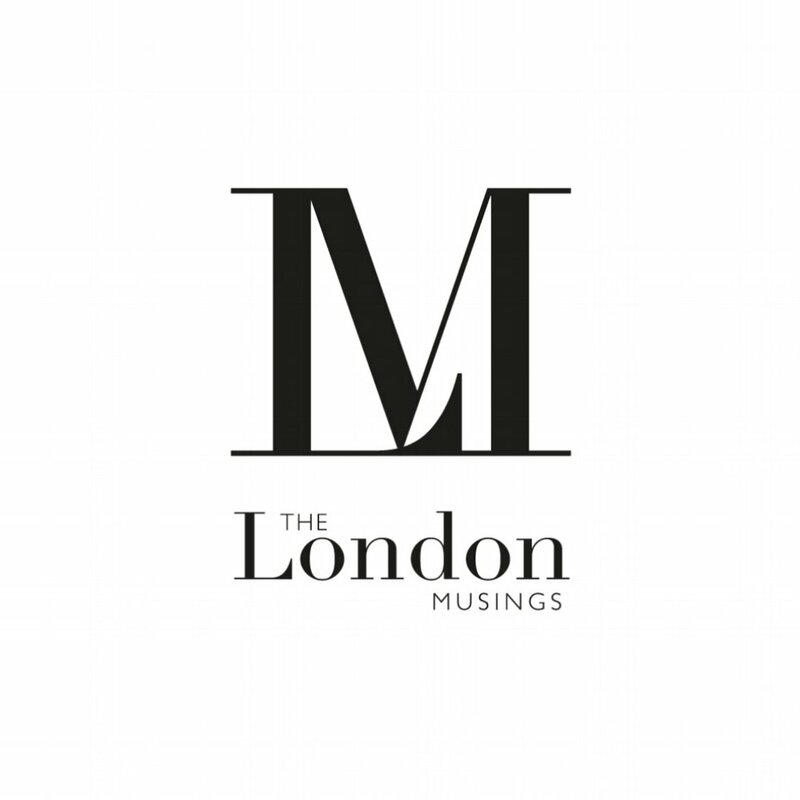 Shanade McAllister-Fisher Interior Design is a fresh, bold, innovative London based design studio. Providing a comprehensive interior design service from conception to implementation. Whether you wish to refurbish a room or an entire home we will work with you to design and create an unforgettable space that epitomises your personality and lifestyle. We hope you enjoy this excellent article detailing different ways you can make a living space seem much larger! In a recent project in Little Venice, West London, I allowed each room to express its own unique identity through the use of colour and patterns in a bid to create zones. These zones then allow the flat to be seen as a collection of spaces rather that one homogenous space. They help the owners and visitors to experience a variety of moods while exploring a limited number of spaces. Something I love to do is to play with proportions. The hallways’ large monochrome patterned wallpaper was chosen to make a dramatic statement and embrace the small space rather than shying away from it. Also, with no natural light in this room I used mirrored doors to create the illusion of depth, while they also serve to bounce artificial light around the otherwise dark space. For the living kitchen room I wanted to create an open, airy, relaxed space with lots of different textures and colours. I incorporated a statement sofa and bespoke kitchen made of ply and walnut, which I feel is a complete work of art. The brief was to create a practical functioning kitchen but one that didn’t look like your average kitchen, it needed to inhabit a single wall, capitalize on the high ceilings all the while having the appearance of a piece of furniture. That way, it would sit more comfortably in its surrounds. In the bedroom I created a calm, tranquil space with the use of a dreamy inky deep blue colour on the walls. The depth of colour far from makes a space feel small, it can actually blur the boundary of the room and in this case gives the impression that the walls sink away into an infinite depth. 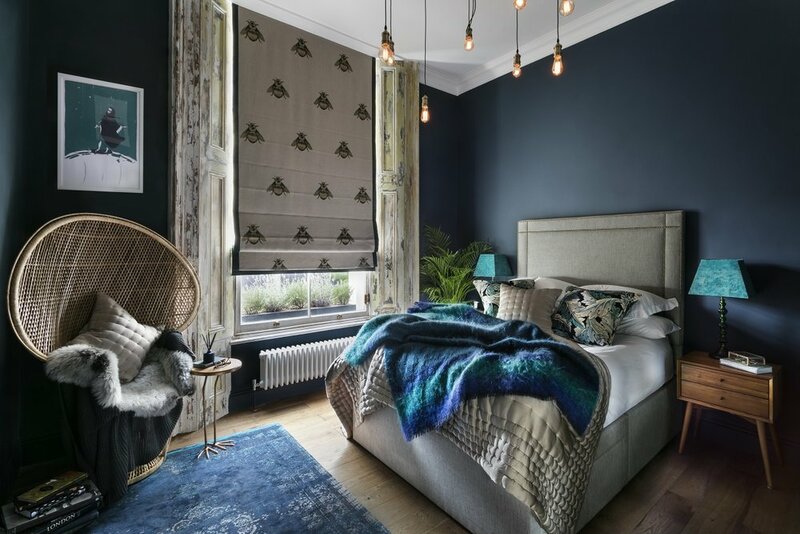 This colour paired with the large bee print roman blind, creates a bold, fun statement piece and allows features like the distressed window shutters to pop out and shine. The rich smoked oak floor was used across the entire flat to allow each room to combine thus making the flat seem far bigger. 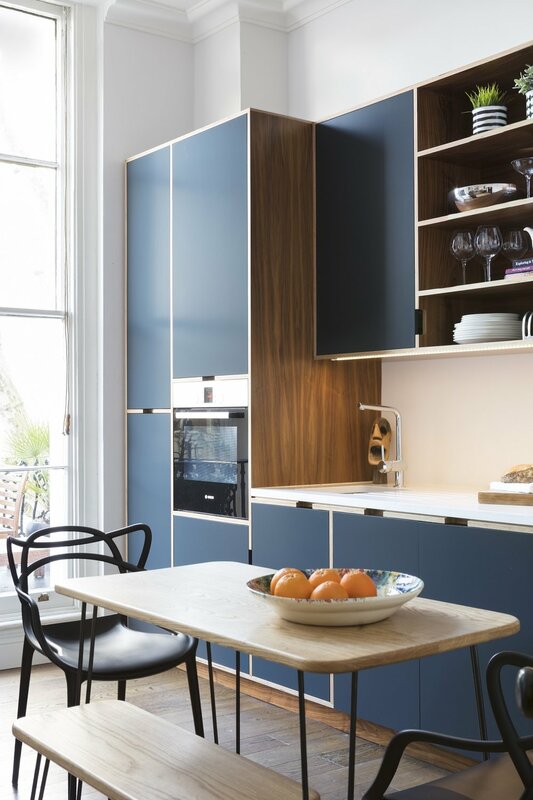 Slim-line furniture has been carefully selected and considered such as the kitchen table which is incredibly unobtrusive while providing a much-needed extended work surface for the kitchen. The dining chairs and floor lamps are wispy, therefore they appear to hang delicately in the air, blocking as little of the view as possible. Bedside tables and hallway consoles are also delicate in their design to help reduce their overall footprint and physical presence. The gallery hand less kitchen was designed to be both functional and beautiful. It is made of Ply and Walnut giving it a contemporary but luxury feel. The exposed ply edges have been oiled to highlight the layering detail, all doors are in a spray finish using Farrow & Ball 'Off Black' and the work surface is made of a composite stone. I also maximised and celebrated the fantastic ceiling height of this flat by playing with the proportions and hanging oversized pendants that draw the eye upwards. In the bedroom and living rooms I have created conversational lighting statements, which again are lean and graceful but create instant focal points. In the very small bathroom I used lots of mirrors and glass to fashion a feeling of space and openness. The strategically placed mirror within the recess on the back wall helps generates the illusion of a small window therefore extending the space. To further play with this trickery I placed an elongated glass vase within the recess to deliberately obstruct the ‘view’ in order to provide a sense of privacy.